It's not often that Hollywood loses one of its great icons — an icon whose career spans decades and runs a gamut of some of America's best-known films. From Grease to Terminator 2, from Roadblock to Gone in 60 Seconds, the unlikely star never became a legend despite never really getting top billing. "It's not the lead character," says Dan Koeppel, a Los Angeles-based author who writes about transportation. "It plays a supporting role, and that's what it should be doing." The icon, of course, is not an actor at all. It's a bridge: the Sixth Street Bridge, also known as the Sixth Street Viaduct, in LA. And it's getting torn down, thanks to a kind of concrete cancer called alkali-silica, which is causing too many cracks and crumbles. The bridge was one moderate earthquake away from collapse, according to the California Department of Transportation. Its demolition, which is slated to occur in stages, began on Feb. 5. With its swooping metal arches, and its concrete art deco base it's hard to forget it once you've seen it. Built in 1932, the Sixth Street Bridge really owes its story to the early 1900s. The Los Angeles River would occasionally flood, and when it did, it would wash away homes and lives. After wooden bridges failed, city fathers decided to build 12 concrete bridges all connecting to downtown. "That scene has an amazing ending," Koeppel recalls. "If you look at the still frame, there's a body in the river, two police cars, and the silhouette — the extremely hourglass silhouette — of the femme fatale is walking off into the distance." "People are letting go little by little, and I think the real feeling is one of nostalgia, sadness," he says. "But there's legitimately simultaneity a tremendous amount of excitement." We're now going to take a few minutes for an unusual tribute. This isn't your run-of-the-mill obituary. Today, we're remembering the most famous bridge in Hollywood. Remember the drag racing scene from the 1978 hit, "Grease"? WESTERVELT: What about one of the great motorcycle chase scenes in "Terminator 2"? WESTERVELT: Picture Arnold with his shotgun racing down a narrow concrete river to save the kid. DAN KOEPPEL: It's not the lead character in this movie. It plays a supporting role. And that's what it should be doing. WESTERVELT: That's L.A.-based author Dan Koeppel, who writes about transportation. And he's talking about the iconic Sixth Street Bridge, also known as the Sixth Street Viaduct in Los Angeles. The bridge is being torn down, thanks to kind of concrete cancer called alkali-silica, which is causing too many cracks and crumbles. The bridge was a moderate earthquake away from collapse, according to the California Department of Transportation. With its swooping metal arches and its concrete art deco base, it's hard to forget the bridge once you've seen it. Built in 1932, the Sixth Street Bridge really owes its story to the early 1900s. The Los Angeles River would occasionally flood. And when it did, it would wash away homes and lives. After wooden bridges failed, city fathers decided to build 12 concrete bridges all connecting to downtown. KOEPPEL: Those are all beautiful art deco bridges, different themes. And the Sixth Street bridge is the jewel of them all. WESTERVELT: The riverbed underneath the bridge was eventually paved to control flooding. That concrete also beckoned Hollywood, making the bridge much easier for film crews to access. No one really knows the first film that made the bridge famous. But one that comes to mind is the 1951 film noir, "Roadblock". UNIDENTIFIED ACTOR: (As character) Oh, honey, haven't you left for Texas yet? KOEPPEL: That scene has an amazing ending. If you look at the still-frame, there's a body in the river, two police cars and the extreme Hollywood hourglass silhouette of the femme fatale is walking off into the distance after her lover is gunned down. 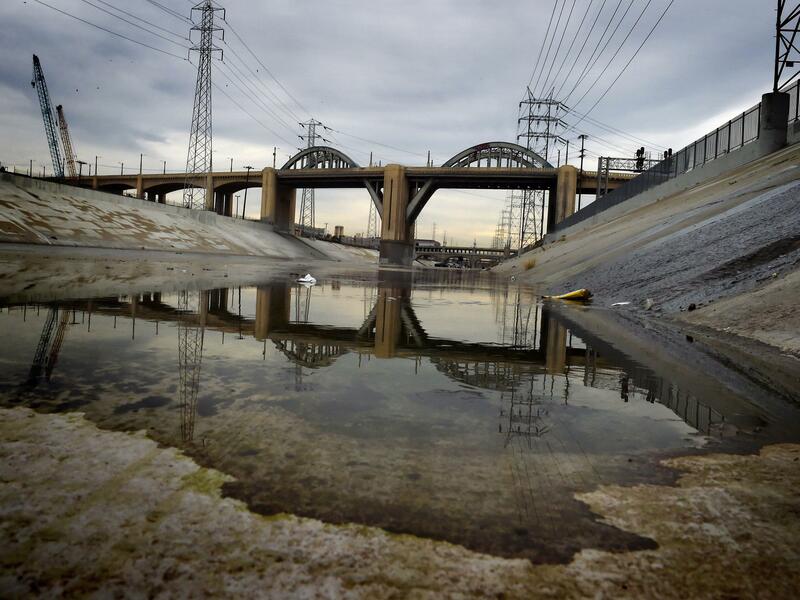 WESTERVELT: Even the mayor of Los Angeles has some personal memories tied to the bridge. ERIC GARCETTI: I can remember walking underneath the bridge as a kid with my sister and my father and just kind of looking up amazed. You know, it seemed like a bridge that never ended because it's a really long bridge. It spans much further than just the river. And it seemed to kind of come straight out of the neighborhood that my family had grown up in. WESTERVELT: Mayor Eric Garcetti says change is hard for any city. GARCETTI: People are letting go little by little. And I think the real feeling is one of nostalgia, sadness. But there's legitimately simultaneously a tremendous amount of excitement. I think if we had tried replace it with something that looked like the past, it would've felt fake. But I think there's a genuine excitement about this bold new design - that this is our generation's chance to do exactly what those who came before us did as well. WESTERVELT: The new Sixth Street Viaduct is scheduled to be completed in 2019.